So you guys…I just can’t keep myself away from the cakes. Fall is one of my favorite times of the year, all the fall flavors are popping out of the woodwork and I can’t help but adore baking this time of year because all the apple and pumpkin recipes are hands down some of my favorites. If you haven’t ever baked with apple butter before, I highly encourage you to use it in whatever you can. This stuff is liquid gold. It is so delicious in rolls, on toast, in breads and cakes! 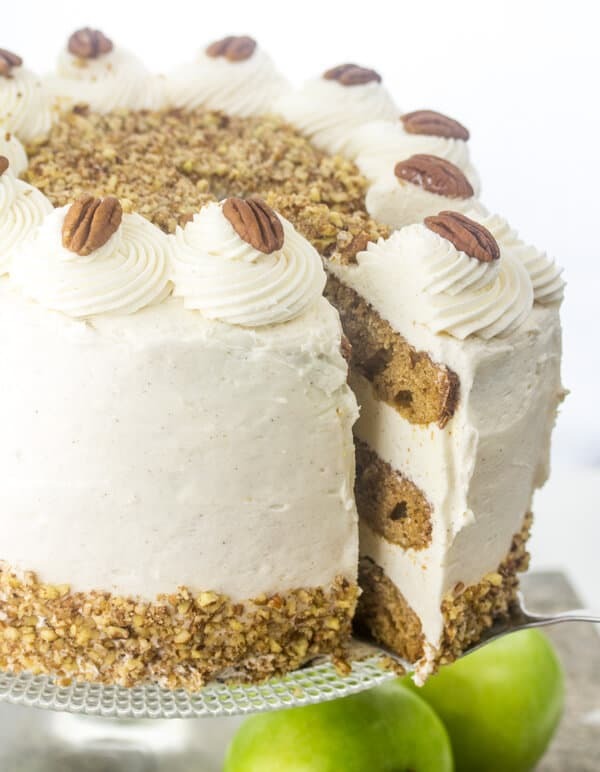 Especially this Apple Butter Layer Cake! 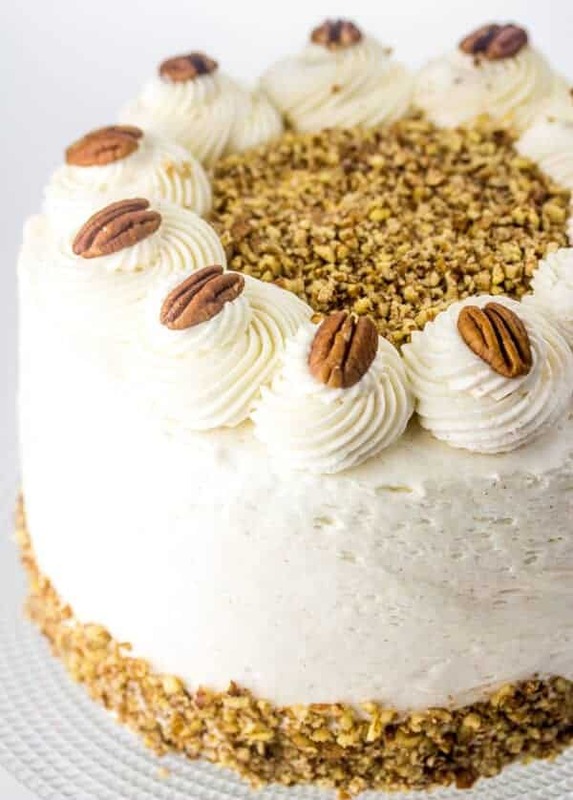 This lightly spiced cake is 3 layers of towering deliciousness that is literally filled to the brim with a cinnamon cream cheese frosting that is good enough to just eat with a spoon…or shovel, because this cake pretty much requires one. Like a little extra crunch? Well I added some chopped pecans to the batter which made the texture of this cake off the hook! 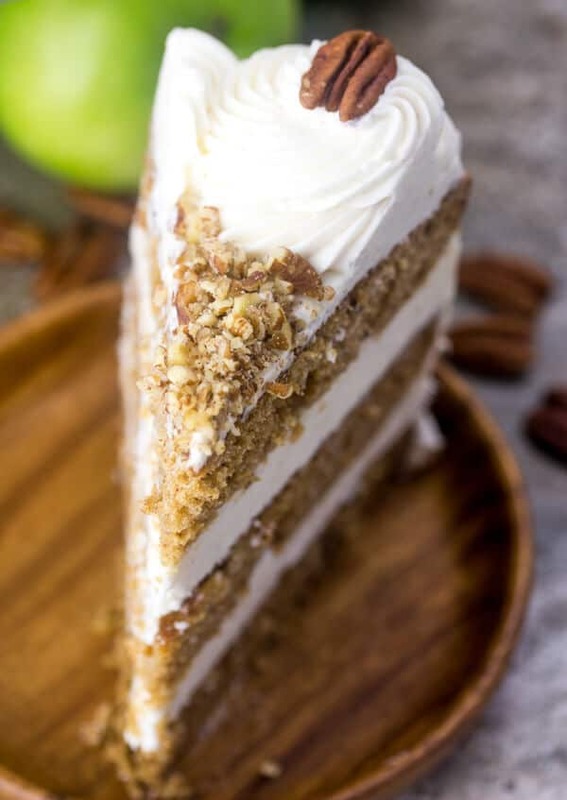 I love the flavor of apples and pecans together so this cake really really worked well in the flavor department for sure, no denying that. But if you’re watching your waistline then unfortunately you’ve come to the wrong place my friend! The frosting in this cake alone uses 1 1/2 cup butter and 1 1/2 cup shortening. I know a travesty, but still…a treat once in a while is totally worth it I say! 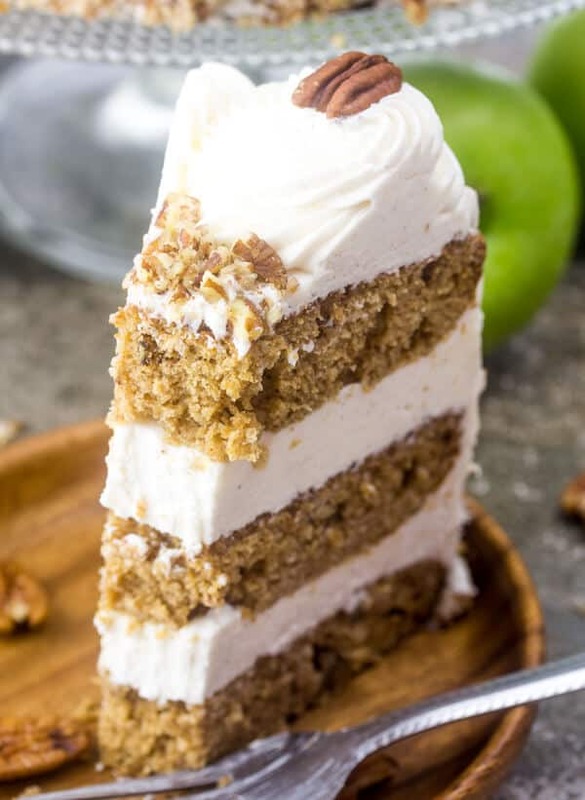 You can totally go thinner with your frosting and maybe even half the recipe, but I mean I say go big or go home and that’s exactly what this Apple Butter Layer Cake is! It is a big, show stopping, calorie filled, heaven in your mouth, fun fall treat that I’m so happy I was able to make!! 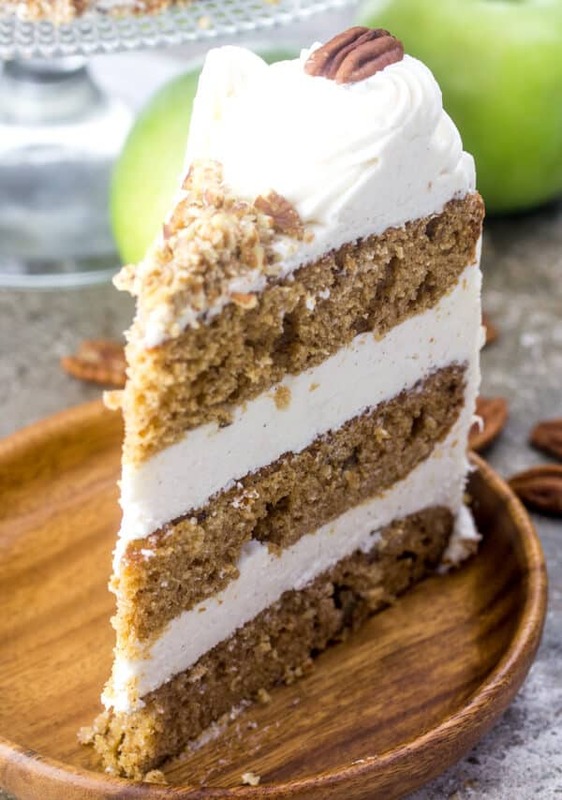 This Apple Butter Layer Cake would be the perfect cake to bring to any family gathering say…Thanksgiving…Labor Day or just because you feel like making a dang cake, that’s usually the excuse I have, just because I want a cake and that is 100% okay with me! Cake is life my friends, CAKE IS LIFE!!! 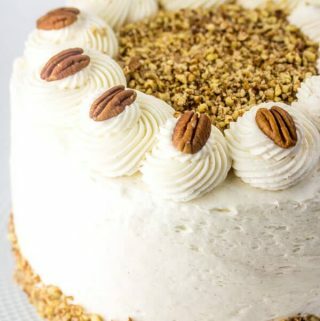 So if you’re ever remotely thinking about maybe baking this fall (you know you are) this cake has to be at least considered. In all honesty, it’s simple to whip together and the flavors are to die for! It is massive so a little piece goes a long way. All in all it is the perfect party cake that everyone will enjoy! Prepare 3 8" round baking pans with cooking spray or parchment paper. In bowl whisk together your flour, baking soda, cinnamon, nutmeg and allspice. In another bowl beat together your butter and shortening until light and fluffy. Beat in your eggs one at a time until blended. Alternate adding your dry ingredients and milk to your butter mixture until incorporated. Mix in your apple butter. Fold in your chopped pecans. Pour into prepared pans and bake for about 30 minutes or until center is set and toothpick comes out clean. Remove from oven and turn out onto cool racks to cool completely. Meanwhile to make your frosting beat your butter and shortening together until light and fluffy. Add in your cream cheese and continue to beat until blended. One cup at a time mix in your powdered sugar adding your heavy cream as needed. Lastly mix in your cinnamon tasting as you add for desired flavor. To assemble, layer 1 of your cake rounds on a turntable or cake stand and add about 1+ cups of frosting and spread to about 1/2 inch away from edges. Once top cake layer is added, start frosting your cake along the sides in a thin layer to create a crumb coat to seal in the cake. Remove from refrigerator and finish frosting from top down. 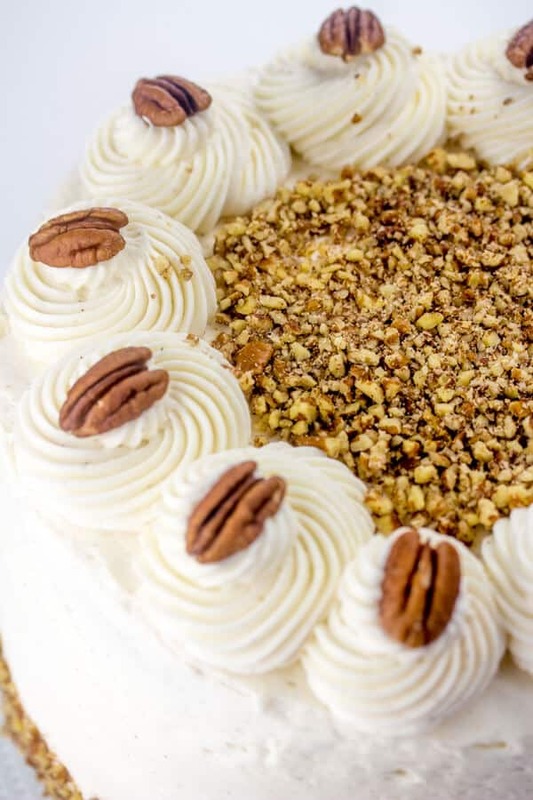 Decorate with dollops of frosting on top with chopped pecans and chopped pecans around the side if desired. Okay, I’m confused. You don’t list shortening under the cake ingredients, but you mention mixing it with butter to make the cake. I’m in the midst of making this and I’m afraid of it the being too dry if I don’t put the shortening with the butter like you say in the instructions, but I don’t know how much to use!